Jennifer returned to San Rafael on the CocoPups Fun Day Bus 2014. She has been chosen to join the breeding program. 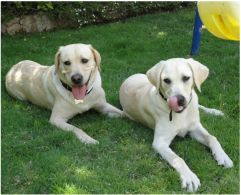 Denisha, a yellow lab, was raised by Monica and Laureen. She had her first litter of 7 yellow puppies on December 31st, 2010. Laureen and Monica submitted names for the puppies and 4 of the names were chosen...Marble, Mowgli, Mecca and Millie. Mina, who was raised by Laureen and Monica, is one of Denisha's puppies. Denisha, has been retired from the GDB breeding program. Garcelle, a golden retriever, is the offspring of Ryka and was raised by the Cupp family. She is still producing litters for Guide Dogs for the Blind. Ryka, a golden retriever, was raised by the Cupp family and produced 2 litter of puppies before she was retired. She now resides in California. Garcelle, a puppy from her first litter, was also raised by the Cupp family and also went on to be a breeder.